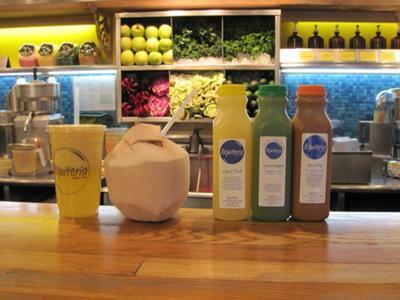 Absolutely amazing fresh squeezed juices made on the spot and right in front of you at Liquiteria. I really love their taste; you talk about smoothies, juices, wraps or anything they just rock. My usual orders are the Tropical Kiss and the Peaches-n-Dream. The freshly pressed juices they sell are fabulous, and I think in those there specialty is all green juices. One thing which makes their green juices better than all the green juices available in nearby bars is that they don't dilute the greens and overpower the flavor by using too many fruits (like apples etc). They keep it as real as it gets. 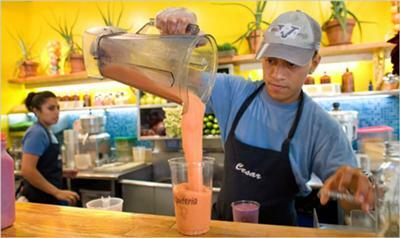 Grasshopper is another great option and probably the most consumed Juice in Liquiteria. I also love there Avocado wrap. They have a dine-in area and also have nice bottles if you want to take them away. The bottled juices that they sell are made using different machines, so their vitamin/enzyme content is higher than the freshly prepared. They have a very informative website with all the details. Everything I have ever tasted there is fresh, organic, excellent quality and well balanced. I really like the fact that they use organic ingredients and no gross additives and syrup sugar mixes. While you are passing by it is not possible to miss the amazing smell of fresh ingredients. As far as the prices are concerned, yes you can say it’s a bit towards the expensive side when you compare it with other available Juice bars, but I think Liquiteria juices are worth it. Plus it’s NYC! I feel everything available here is worth every penny and a good value of money as you are getting a high quality product too. The staff is very friendly and welcoming. Many times they give free samples of their new additions on the menu and give you great recommendations if you want to go creative and try to make your own drink, with your own choice of fruits and veggies. One thing to keep in mind, they have only two options for payment, either cash only or a high credit minimum, although I forget the minimum. Overall they have excellent staff, which is very friendly and inviting. And have excellent service time. I have never waited there more than 10 minutes, no matter how many people are there they always care about their customers. 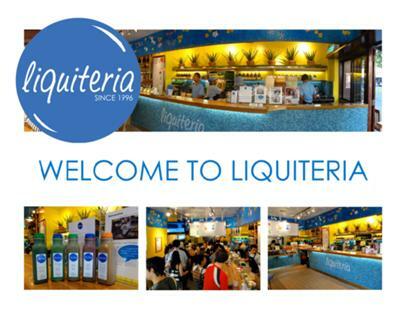 Check the Liquiteria website for more info. Join in and write your own page! It's easy to do. How? Simply click here to return to ADD a Juice Bar. Wanna build a site like me? Build Your Website: Juicer-Reviews-and-Recipes.com is Powered by SBI! To compliment your goal of achieving optimal health, my mission is to provide you with 100% unbiased reviews on every juicer and blender on the market today. Plus offer some amazingly delicious recipes to make your journey more interesting and exciting. Thank you for visiting Juicer-Reviews-and-Recipes.com! Leave Me Feedback! This site is for informational purposes only and is not intended to replace your Doctor's professional advice. Statements within have not been evaluated by the Food and Drug Administration. None of the information or products offered by Juicer Reviews and Recipes are intended to diagnose, treat, cure or prevent any disease. This site does not except free products or money in exchange for positive reviews or recommendations. The views expressed on this site are strictly the personal opinion of the writer and publisher of Juicer Reviews and Recipes.com. Consumer Tip: Comparison shop at Bizrate for your next Juicer or Blender.